30th Dec: Clear, seeing 1/3, crescent moon, artificial sources of light close to the observation site, Bortle 5. Since I saw this wonderful comet on last december, I haven’t had the opportunity to process the raw sketches on photoshop. 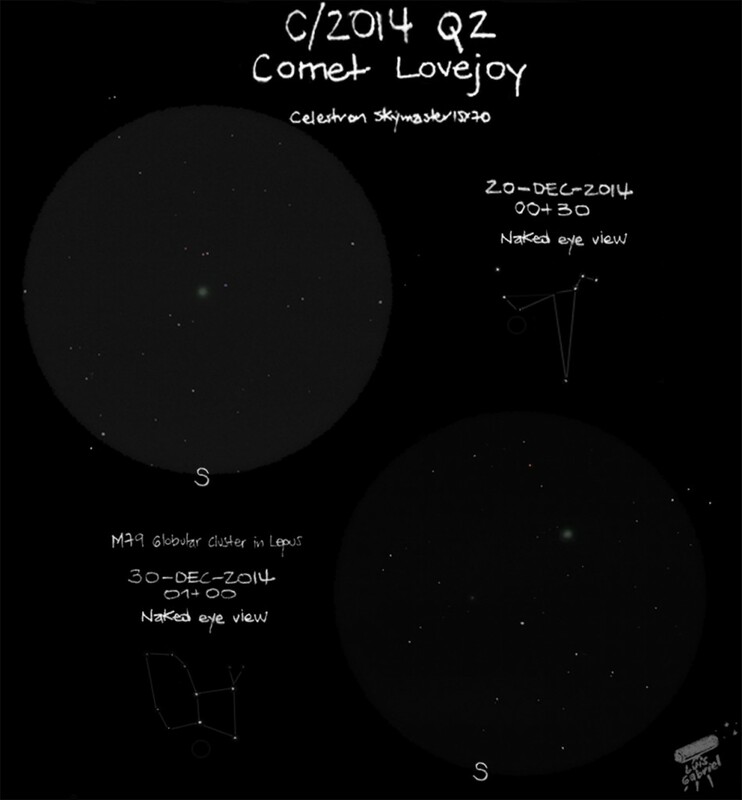 I was initially planning to do one sketch, but since on 30th December there was a “conjunction” with M79, I decided to compare how bright they seemed compared each other. There was an enormous difference in apparent magnitude between the two objects as you can see in the sketch. I have the “feeling” of having seen the comet tail but being honest I could not adapt well my night vision since there was a lot of artificial lights around and therefore It could be just a “feeling” than a real view. Once again let me invite you to check other of my sketches in my blog: pollutedskiesstargazing.blogspot.com. Thank you for posting your sketches of Lovejoy in comparison views. You have illustrated the change in magnitude masterfully. I also enjoyed your blogsite and all the wonderful work there. You are welcome anytime to check the sketches on my blog.